Darjeeling: It was Asha's first ever tryst with Darjeeling that she had heard about from her father and grandfather, not quite the one that she was born and brought up in. Asha, a Class 9 student of a Hill school, was used to a Darjeeling where rallies, slogan shouting and bandhs were a daily affair. The days of unrest usually paved way for agitations marred with violence. But today, the scenario is very different. 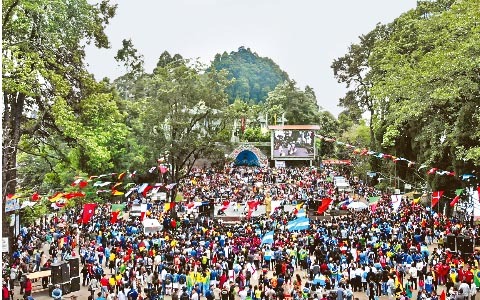 On Saturday, thousands of students along with people from all walks of life, took to the street with flags and cheered, sang and danced to celebrate the spirit of Darjeeling and the teams they support for the upcoming football World Cup. The frenzy gripped the Queen of Hills that was labeled as Darjeeling — the World Cup Town 2018 by the citizens. Though the world will ring in the football World Cup on June 14, Darjeeling kick started the frenzy on June 2 with a mega event organised by Darjeeling North Point School Alumni Association (DNPSAA,) along with various other organisations, NGOs and citizens of the region. "We are celebrating the spirit of Darjeeling along with our love for the game. We want people to know that Darjeeling is peaceful and the nicest place in the world. We want people from all over the world to visit Darjeeling," stated Ajoy Edwards, Vice-President, DNPSAA. Veteran footballers, students from different Hill schools, locals and even tourists joined in the parade that went around Chowrasta and down Nehru Road to return to where it began. The marchers shouted slogans and danced to football-themed songs. The parade was led by footballer Nirmal Chettri of FC Goa. The town was decorated with separate team flags, roadside walls painted up and billboards put up giving the town which is witnessing a huge tourist onrush, a festive look. The day saw cheer-leading competitions, garage sales by Shanker Foundation; dance fiesta by Edith Wilkins Street Children's Trust; bike and scooty rallies from Kurseong hosted by MARG; mountain bike rally; BMX stunts; cosplay, b-boying; face painting; nail art; hair do; musical performances and beat boxing. The bike rally from Darjeeling to Kurseong and back was a major attraction. Even women riding scootys, mountain bicycles were part of it. Aces — the Super Bike club from Siliguri also joined them. "I had heard from my father and grandfather that Darjeeling used to be the safest, most peaceful and cosmopolitan place in the country. It was a great place to live in. In the past, I had never seen anything to connect the town with such claims. However, today (Saturday) was different. Hope we get back all the goodness of good old Darjeeling soon," said Asha. The award for the cheer leading competition was won by Gyanodaya Niketan School, Darjeeling. An award for best decorated area of the town (World Cup theme) was also announced. 10-year-old Pratham Thapa, an MTB rider, was also felicitated. "The event is not just about fun. It has an underlying cause. With the participation registration amount we will buy an ambulance for our project the Clinic on Wheels. This is an ambulance fitted with a mobile lab and ECG machine. The mobile clinic will visit far flung areas every week and provide medical test facilities to the marginalized at highly subsidized costs," stated Deven Gurung, president, DNPSAA. The organisers also want to revive the golden era of football in the Hills including the famous Brigade of Gurkhas Gold Cup football tournaments. "Even back home celebrations have not yet commenced. Darjeeling has beaten us. I'm happy to see that England too has quite a fan following in Darjeeling," stated Neil, a tourist from England. Darjeeling and the teams they support for the upcoming football World Cup. The frenzy gripped the Queen of Hills that was labeled as Darjeeling — the World Cup Town 2018 by the citizens.